Everyone’s made use of a hand router before, and although they’re definitely needed on very large pieces, the precision and ease of working with a benchtop router cannot be beaten. If you’re looking for the best benchtop router table available, you’ve come to the right place. First we’ll discuss some things to consider when purchasing such a device, and then we’ll look at some of the details of six of the best benchtop router tables currently on the market. The first thing to look at is size. Benchtop routers come in three main form factors. Although what you’re going to be doing with the router is important, as well as the size of objects you want to work with, you probably don’t have acres of space in which to locate all your tools. As such it’s important to identify where you want to place your router, and ensure you have space for it and to maneuver material around it. The smallest of the router tables is a bench top machine. Literally a small platform that you place on top of your bench. These will be relatively small, but remember that all routers are fairly tall, so you’ll be working higher than normal. Some may include clamps to quickly fasten them to your bench, but others are intended for permanent installation and will generally be bolted to your bench. If you’re fortunate enough to own a decent workshop, you’ll have space for a full-sized table router. These are the best, as the work surface is at a comfortable height, and it’s easy to place and work with your material. If you already have a table saw, you may be able purchase a router table extension. These will be platforms that are made to fit onto certain table saws. 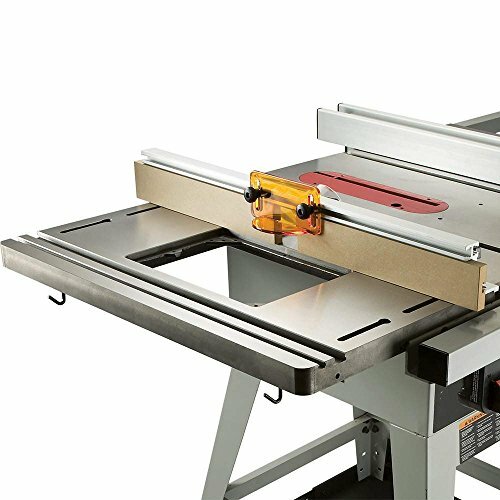 The sizes are fairly standardized, so if you have a contractor-grade table saw, it’s quite likely that you can purchase just an attachment, which will not majorly increase the footprint of your existing table saw. Besides size, there are a number of attachments that can be included with a benchtop table router. These can be for material removal, protective shields or fences to guide the feeding of material. Also, keep in mind that most benchtop router tables do not include the router itself, so if you already have a router, you’re looking for a benchtop table that can support your router. If you don’t have one, be sure to check out our review of the best routers available. One of the most popular benches on offer, the work surface measures 27×18 inches, and will sit just over 14 inches above your bench’s surface. At a very reasonable 30 pounds, thanks to its plastic support frame, it’s light enough to stow away and only pull out when you need it, but heavy enough to be used without mounting it. If you do choose to mount it, four holes are located on the legs to take bolts. 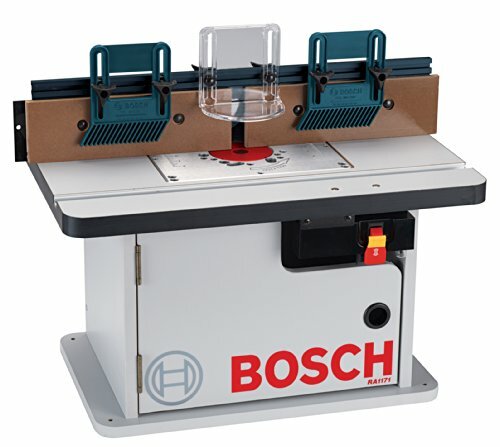 Although it may only be the second cheapest benchtop router table on our list, the Bosch RA1181 has a number of advantages over its competitors, as well as its slightly cheaper brother, the Bosch RA1171. One of the main differences between the two products is the RA1181’s use of a metal table top. This makes it more durable in comparison to the laminated MDF top of the RA1171. It’s also one of the most adaptable in terms of accepting different routers. It is compatible with most routers and includes mounting hardware for a variety of devices. Additionally, the Bosch RA1171 features a tall aluminum fence, at just shy of 5 inches along with two adjustable featherboards for keeping your material in place, and making feeding easy. These can be mounted either horizontally or vertically, and a clear face plate is provided to keep things safe, while maintain visibility and control. On the power side, it has two integrated outlets with an extension, and a front mounted switch features overload protection and a lockout key. Mounted on the fence is also a dust collection port which can take standard a 2.5 inch vacuum hose. 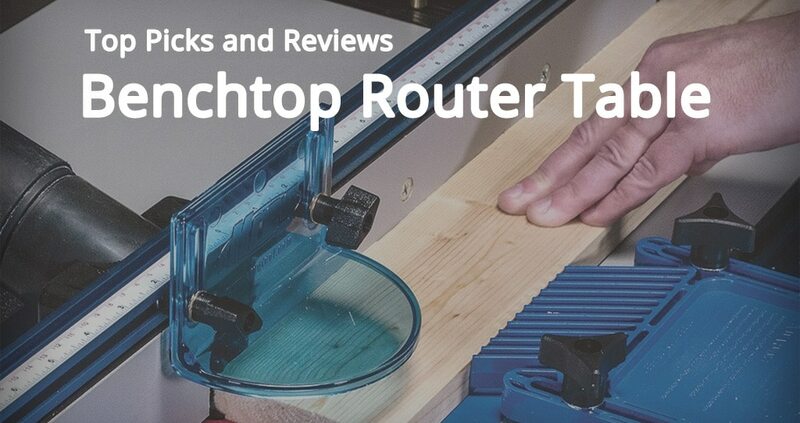 A great tool if you’re not interested in investing in a full-size table, and already own a router that may not be compatible with other benchtop offerings. Even though the frame is made of steel, the Kreg PRS2100 bench top router table is still the lightest of our picks, coming in at 28 pounds. Still sturdy though, the Kreg PRS2100 is designed to be mobile, and would be at home on any worksite. Adding to its portability is the easily removable insert plate that features precision levelers and new Level-Loc reducing rings for accurate router fitment. From a surface perspective, the Kreg offers up a moderate 16×24 inches of thick MDF to work on, more than enough to support most projects, and smooth enough to avoid any hiccups. Focused on the industrial action, the table’s router insert plate measures just over 9×11 inches, intended to support even the biggest router. The table’s frame is mounted on rubber feet to minimize vibrations, and while the open design is good for sound dissipation, pre-drilled holes on the frame make it easy to mount boards if you wish to enclose the space. The supplied fence is made from anodized aluminum and has adjustable sliding faces. A single dust collection nozzle is present, and the rest of the fence is occupied by a number of clamps which allow for quick and easy adjustments. Although not included, additional Kreg featherboards are sold in packs of two, and will clip right into the PRS2100. While capable in a home workshop environment, the Kreg PRS2100 is definitely meant for the worksite. With a strong steel base, the sturdy design and ability to handle larger routers puts it right at home with heavy work. Lack of included featherboards or power outlets place the Bosch alternatives ahead of it for at home use. Very similar in form and function to the Bosch RA1181, the RA1171 does have a number of differences. The most obvious of which is the RA1171’s cabinet style. With a 25×14 inch working plane, it’s marginally smaller than the RA1181, with a similar height. It is much heavier though, with the cabinet being made of steel, a sturdier frame is provided bringing the weight up to 42 pounds. The inclusion of the cabinet means you’re most likely going to be storing items inside it, further reinforcing the idea that you will want to make this a permanent feature on your work bench. Besides this the benchtop table includes the same two featherboards and MDC face plate to keep your material in place while you’re working on it. Likewise, a double outlet with 6-foot extension is provided with matching lockable switch at the front. Other slight differences come in the form of the work surface which is laminated MDF as opposed to metal, and the 5 inch-tall fence features not one, but two dust ports to fit standard 2.5 inch vacuum hoses. Coming in a bit cheaper than the RA1181, the Bosch RA1171 is definitely the right choice if you’re able to permanently place it on your benchtop. The ability to store router bits and featherboards can keep your workplace neater, never having to waste time looking for parts. Fits all contractor-grade table saws and all right-tilt cabinet-grade table saws that have 27-Inch deep by 1-1/2-Inch thick cast iron tables. Included ProFence quickly dismounts and hangs on provided j-hooks while you use your tablesaw. Includes router top, fence, and mounting hardware. ProPlate is sold separately. Plate opening 8-1/4 by 11-3/4. The ProLift 40-150 has a 3/8" thick plate. If you already own a table saw, a router table extension is the obvious choice. It has the smallest impact from a floor, or bench space perspective and in fact adds to the overall workspace available to you when using the table saw. Important to note is that the Bench Dog Tools 40-102 is just the router table extension, and does not include the ProPlate. The ProPlate is what you actually mount your router to, and fits into an 8.25×11.75 inch opening in the router table extension. What you do get though is the router top, a fence and mounting hardware. The router top is made from cast iron and the fence is an impressive 28 inches long, made of a single piece of machined aluminum, it is both heavy-duty and precise. The tool’s design is also flexible enough that the fence can be rotated, allowing you to work in either direction, maximizing the workspace you have to operate on. A 2.5 inch dust collection port is also offered for extraction. This is a great product if you have a suitable table saw. It is more expensive than some of the benchtop table options though, especially when you consider that you’re going to have to pay extra for a mounting plate as well as featherboards. But the cost could be worth it for the high-quality product that it is, especially in a space-constrained workshop. 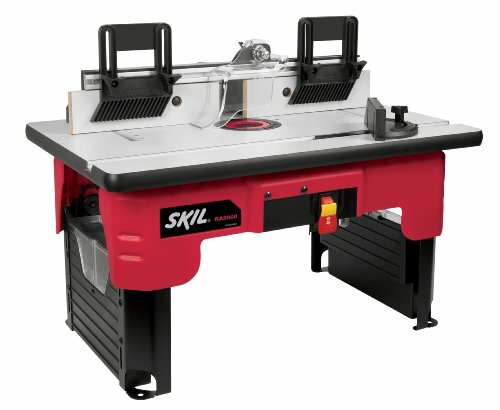 If you’re looking for a compact benchtop router table, look no further than the SKIL RAS900. Able to be transported, the RAS900 is ideally suited for the home workshop where bench space is limited, but there’s space to hide away a tool box. Its most striking difference to other benchtop router tables is that the legs fold in, effectively halving the amount of space it occupies. The legs even have built-in storage compartments, further boosting the RAS900’s storability. The table is fairly sizable at 26×16 inches and is made of smooth laminated MDF. Along with the table, you get a fence, also made of MDF and sporting a standard 2.5 inch dust port for vacuum connection. Connected to the fence is also a clear guard help support. Included in the set are two featherboards. Both are mounted with simple to maneuver screw clamps, easy to setup, and quick to adjust. Further care was taken to implement a dual outlet switch similar to those seen in the Bosch products, but SKIL have even added a bit height gauge to ensure accurate setup. Especially useful if you’re regularly dismantling and reassembling the tool. If you have limited space in your workshop, then the SKIL RAS900 is definitely the setup you want to be looking at. Having covered a full range of benchtop router tables, it is left to us only to still review a full-on router table, and that’s what you get with the Kreg PRS1045. 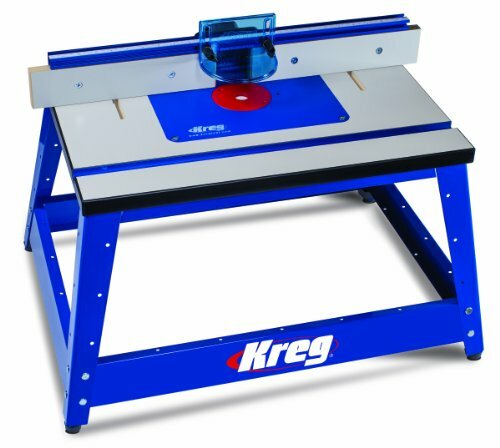 Very similar in appearance to the earlier reviewed KREG PRS2100, the PRS1045 stands 35 inches high, double that of most benchtop router tables. It can be adjusted lower, down to just 29 inches and features built-in levelers to compensate for unevenness. A sturdy aluminum fence is provided in conjunction with a self-squaring system. The fence can be adjusted easily, requiring only one hand and having two locking mechanisms to ensure it stays in place, and does not deflect. At the back a dust port is present, able to plug into standard 2.5 inch vacuum pipes. Once again, you’ll have to fork out extra for some featherboards. This is on top of an already expensive table. Other options include a set of locking castor wheels to upgrade from the standard rubber feet. 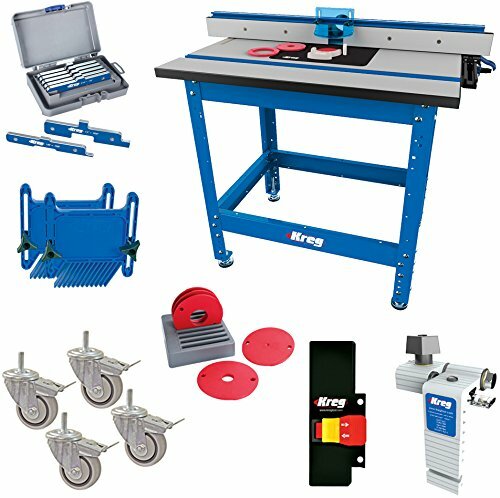 Kreg make excellent equipment, and this is a solid, durable router table that is unlikely to give you any problems. If you have the space and are able to afford it, you will not be disappointed. 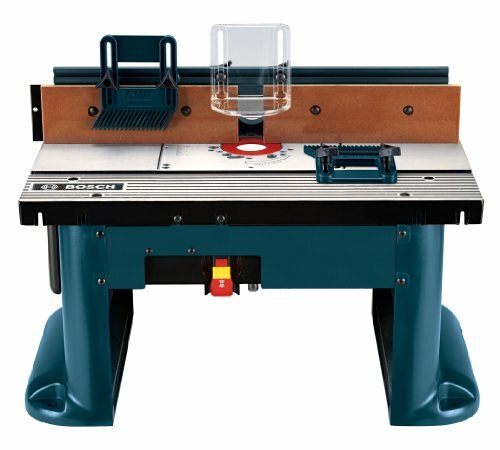 Benchtop router tables come in many different shapes and forms, and regardless of your requirements, our list of the best ones is sure to provide one suitable for your job. If you’re new to routing, or woodwork in general, be sure to check out some of our great tutorials. They’ll guide you through everything you need to know, from safety and equipment to methods and nuances.